Tait made his Test debut against Wales in Cardiff in February 2005 on the eve of his 19th birthday when he was a surprise selection by coach Andy Robinson for the Six Nations Championship opener. It was a match to forget for the youngster as he struggled to impose himself in defence and attack and he was the recipient of a number of big tackles from Wales centre Gavin Henson before eventually being replaced. He was the second-youngest player to have played for England since World War II, with only his Newcastle team-mate Jonny Wilkinson having played at a younger age. However, Tait had to wait another 16 months before adding to his caps, on the 2006 tour to Australia. He has played at centre, wing and fullback and in October 2007 he became England's youngest Rugby World Cup final player, at 21 years and 256 days, when he started against South Africa. A replacement for the opening two matches against USA and South Africa, he made the No.13 shirt his own and almost scored the try of the tournament in the final but for a tackle from the Springboks' Victor Matfield. He was overlooked for the opening 2008 Six Nations match against Wales, before being reinstated in the match day 22 when Mike Tindall was forced to miss the rest of the tournament after damaging his liver. He spent much of 2008 on the bench, including coming on and scoring a try against Ireland to secure a second place finish in the Championship. 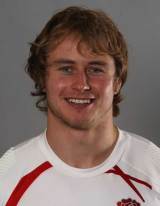 Tait, who joined Sale Sharks at the start of the 2008-09 season, played fullback in England's second Test against New Zealand in Christchurch in June but did not figure in the autumn international series after suffering a hamstring injury. He came to prominence after playing for England 16 and 18 Group, and joined Newcastle Falcons in 2003. He marked his Premiership debut against London Irish in May 2004 at the age of 18 years 86 days by scoring a try with his first touch of the ball. He also played a key role in England's Commonwealth Games challenge in 2006 where they finished with the silver medal. He finished as the tournament's top try (nine) scorer including hat tricks against Sri Lanka and Samoa, together with two in the semi-final against Fiji. He was also a member of the England A squad that won the 2005 Churchill Cup, appearing in the final against Argentina in Edmonton. Leicester Tigers in July 2011 announced the capture of Tait from Sale. It was revealed that Tait had actually been at the Midlands side since February 2011 where he was undergoing rehabilitation for an injury.